This week we have had a few days at home after a chaotic summer. On Wednesday afternoon, one of the hottest day’s we’ve had this year, we decided to go to Kingsbury Water Park. Kingsbury Water Park is a Country Park that has 15 lakes and over 600 acres of Parkland. There are paths, places to picnic, , bike hire facilities, children’s park, a farm, water activities and even more! On a sunny day, or even just a dry day, it is a stunning place. There are lots to do for the old and for the young! When we arrived at Kingsbury Water Park just after lunchtime, parked the car and took our picnic to a field nearby so we could enjoy our lunch. A big thank you to Dan’s Aunty for our picnic bag, it is great! 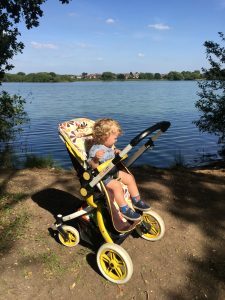 Alfie didn’t want to sit still for long, so we had to quickly pack up the picnic, put it back in the car and grab the pushchair just in case his little legs got tired on the walk. Dan had downloaded Pokemon Go and there were lots of Poke Stops and Gyms (Is that right?!) at Kingsbury, so they kept him entertained whilst I took photos of Alfie! I call that a win win situation really! Alfie just loves playing with stones, picking them up and throwing them. Now if you throw some water into the mix, even better, he can play for hours. 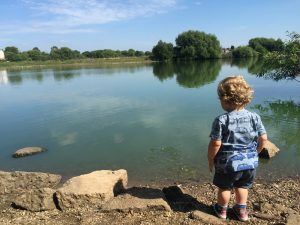 So we spent a lot of time walking around and then stopping at the lakeside when it was shallow and Alfie could stand and throw in stones. He’s getting really good at throwing now… I’m not sure if that’s a good thing or a bad thing! We took our camera with us for the day thinking that we could try to get some nice shots of us, well I realised I don’t actually know how to use a proper camera – If anyone wants to teach me, please do!!. However, my iPhone is pretty good and can take some really nice shots. Or at least I think so! 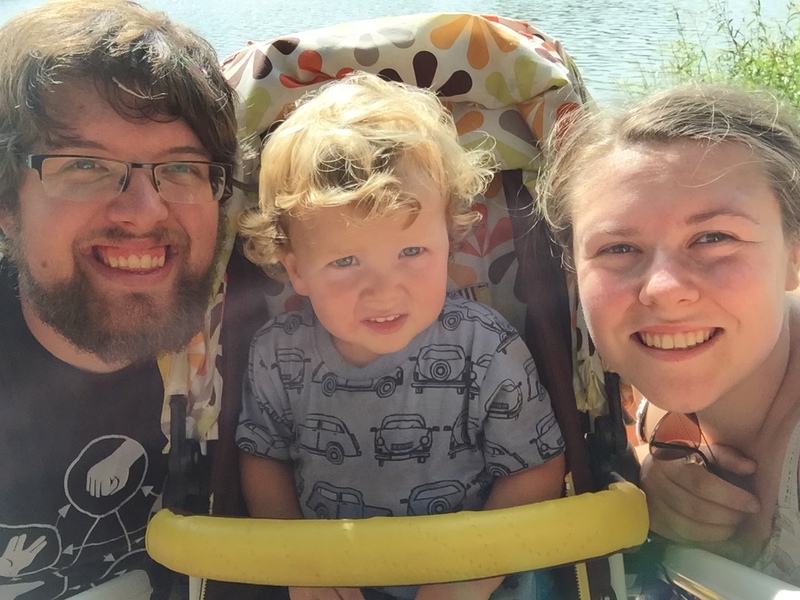 We spent a lot of time just walking around the lakes and talking with Alfie. His speech is coming on leaps and bounds and I’m so proud of him. He is such a chatterbox and he’s really good at talking in sentences that make sense now. He’s always telling us who things belong to, or if he’s hurt himself where and what he hurt himself on. It’s amazing how much they develop at this age and although I’m loving it I would like him to slow down a little bit! Now what kind of day out would it be, on a sunny day, if we didn’t have Ice Cream from the Ice Cream Van? Let me tell you, it would be pretty rubbish!! So we had ice cream… It was delicious and just what we needed after a hot walk around a lake. Who knew a toddler could make such a mess with an ice cream?! Well, I knew, but I tend to forget just before giving him said ice cream, and I remember just after. Hmm. 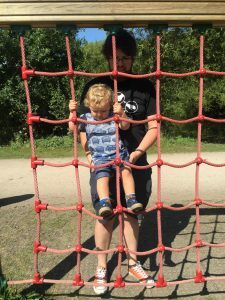 The park at Kingsbury has a ‘big bit’ and a ‘small bit’ I wouldn’t say that the small bit is that small, Alfie definitely could do it, but toddlers smaller or less confident than him may struggle as there are big gaps between steps. So we didn’t spend too much time on the park, Alfie had a run around and a good few slides down the slide before we had a drink and decided we were all getting tired and we should head home. On our way home we had a sneaky trip to Toys R Us for a birthday present for one of Alfie’s friends. He loved it, pressing all the toys, reading the books, cuddling the teddies, sliding down the slide, but he mostly loved pushing a pushchair around. I think we’ll have to buy him a pushchair for his birthday! All in all we had a lovely day together! I can’t wait to spend more time together as a family like that. It was lovely and we have some gorgeous photos to treasure! What ideas do you have for Family days for us? The bonus of this one was that we only paid for parking and ice creams, so although it was cheap and cheerful it was one of our favourites! ← RSC Rooftop Restaurant: Afternoon Tea!